Voyage of Southern Cross sails into your living room. This is going to be fun, exciting and who knows, likely full of surprises and rich moments for this is the way of voyaging in small boats. Come aboard as part of the team that will help this unique small boat circumnavigation of the globe via ship with ports of call in 16 countries continue. The express purpose of the Voyage is to inspire others to live a fuller life and to live stream broadcast this fuller life of a wide variety of experiences and adventures to school kids and friends all over the world. The broadcasts are not just a travelogue, each will be focusing on rich cultures, geography, science and other topics. Join us by by simply checking in to this web site for updates as the little ship circles the globe. Better yet consider making a small donation to help the education side of this project become an ongoing reality. There are benefits to you either way, follow along for curiosity or follow along for curiosity and support of something that is just plain good of heart! All of us as fellow adventurers, sailors, hikers, mountain climbers, cyclists, kayakers, naturalists, photographers, outdoor educators and arm chair dreamers have the possibility of working together to make this voyage a reality. Howard Rice envisioned a solo long distance voyage into the deep wilds of Tierra del Fuego many years ago and followed through by building a boat, equipping it, shipping it to Chile and most importantly by taking time to interact with elementary school kids in a profound act of giving through interactive live stream lessons into classrooms. Howard heard the teachers involved speak highly of the program and the difference it made in classroom engagement and learning outcomes. As a former college professor he understood completely knowing full well that classroom engagement is key to successful learning. All good teachers spend considerable time refining how they keep students engaged and are constantly seeking new methods for engagement and this one seems to have struck a cord that calls for more. 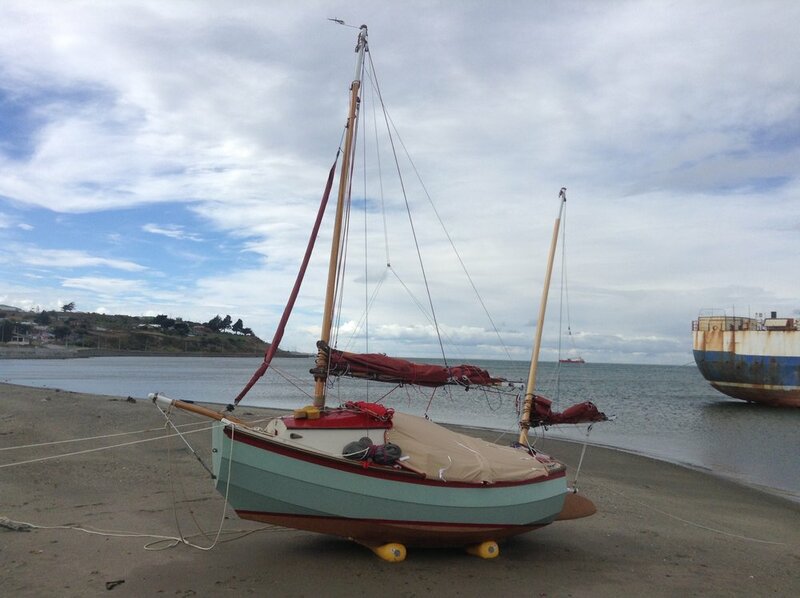 Howard was so inspired and thrilled to be able to provide this service that he decided to push on and fulfill a personal dream of sailing a tiny boat in some of the most intriguing and beautiful places on earth and he has invited the world elementary education to join him at no cost. Lofty Goal!........................Yes but one that is completely achievable if each of us lends support. Map of the world showing route of shipping and each country/entry ports. We know there could be lots of Questions and we think we have the Answers you will want to know. If there is anything we are missing, Please contact us and we'll get back with you as quickly as possible. Here is just a sample of the things we will be making available. Outfitting our container, preparation and updates discussed on our Blog. The container will serve as shipping crate for boat and all support equipment. It will then serve as in country headquarters, communications center, safe storage, temporary accommodations and work shop. Helping us fit it out is a great way to think about supporting our efforts. Clink the link see what it is going to cost, and consider support at one or more of these levels.